CoaguChek XS 24 PT Test Strips: Box with 1 vials of 24 strips each with a code chip. For use with the CoaguChek XS Meter. Please Note: These strips are NOT to be used with the Coaguchek S Meter and are only for the Coaguchek XS Meter. 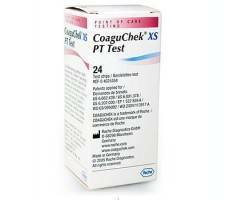 Coaguchek XS PT strips are also available in boxes of 48. To visit the product click on Coaguchek XS PT Strips 48.